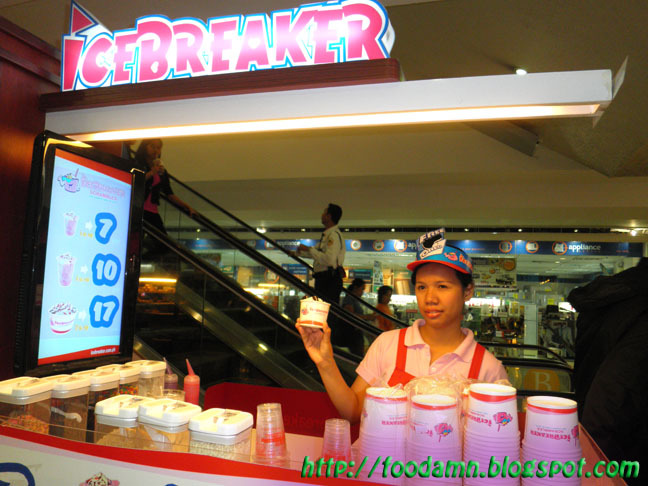 We've outgrown ice scrambles from a "manong' vendor, from a school vicinity or where crowds usually feast to a cheaper alternative. Scramble reminds us of our happy childhood days and the old school plastic cup of pinky shaved ice. Thus, we love streetfoods, it's for "matibay-tibay na sikmura" as we say =) When you treat yourself something from what they call street food vendor, you kinda look away from the hygienic side. A gamble at stake. But we are Filipinos, the distinct taste and food art we create becomes a habit-forming. Marlon Sevilla, a tourism graduate from UST ventured into the food business after comparing the potential income from an ordinary scramble vendor who takes home 800/day sales against his iced-based earnings. He moved on and thought of an idea that would appeal with the "masa" [average, ordinary] crowd. Why not a scramble with a twist? 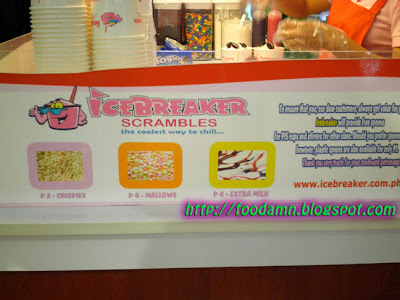 The concept of Icebreaker's "clean factor", the eye-candy color topping selection and add-ons, and very affordable price made an instant hit towards a yummier, more appealing and a tastier scramble. 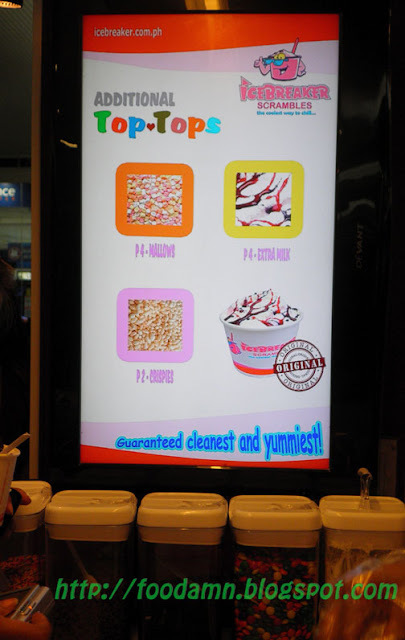 We were treated with scramble with Oreo toppings, Sevilla's latest addition to his topping selection aside from mallows, crispies and extra milk. I wonder when will he add some blueberries on it? =) and still remain in-expensive. 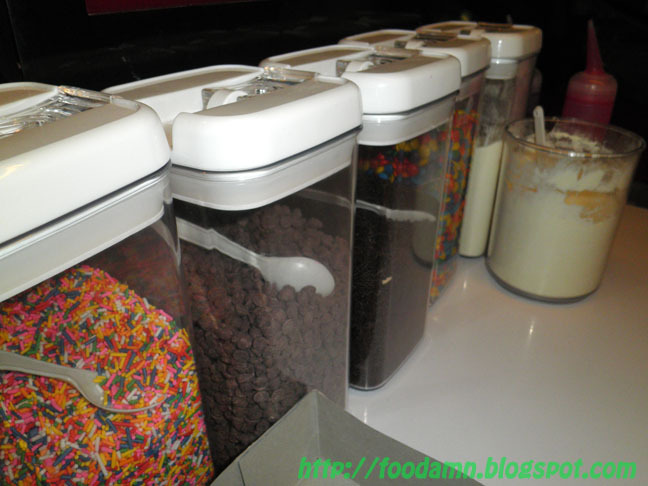 The Oreo cookie bits blend quiet good enough with the pinky slush. A healthier snack for kids without hurting your pocket. 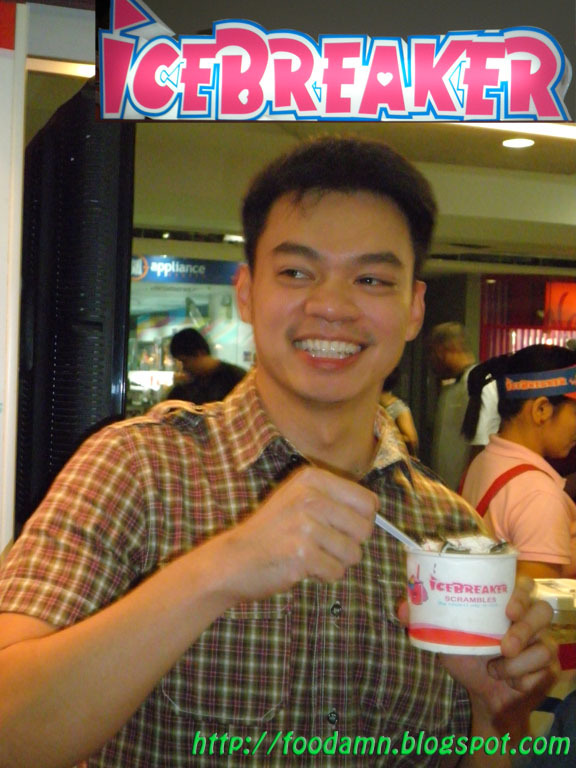 Icebreaker has almost 40 [and counting] branch nationwide. Sevilla will soon launch another ice-based beverage concept Swoosh in Trinoma Mall. I admire this young entrepreneur for his determination and creativity, using ice as his major business component is a very wise-move. "the coolest way to chill..."
my daughter eya loves ice scramble too!!! its yummy!! mayron din yan dito sa Davao hehe. Happy FTF. 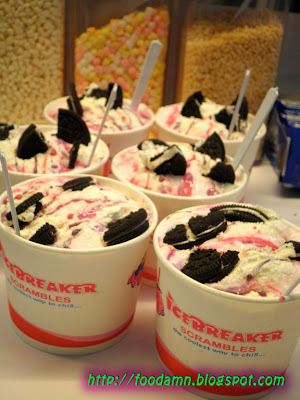 ice scramble kids favorite and also me. sosyal natong ice scramble ha... sarap looking.. dropping by for PF..
Spice Up Your Life, have a safe and happy weekend. For sure hit na naman yang mga ganyan this summer!! sure looks yummy. visiting from PF. Visiting here from PF. :) Here's my Pink Fridays entry. ^^, My apologies for the late visit. I discovered countless interesting stuff in your weblog particularly its conversation. From the numerous comments on your posts, I guess I am not the only one getting all of the fun here! keep up the good work.